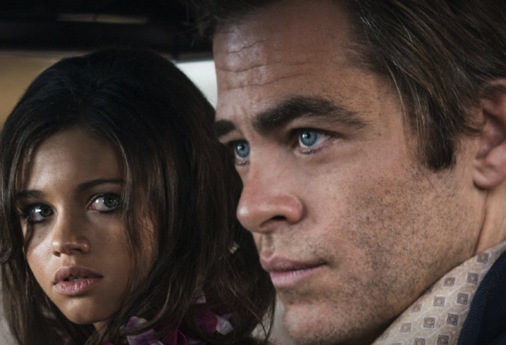 Chris Pine’s character regularly takes a beating, as does the overall believability of TNT’s ambitious but convoluted I Am the Night. Very loosely “inspired by the life” of the late Fauna Hodel, the six-part limited series officially premieres on Monday, Jan. 28th after Episode 1 was sneak-previewed following TNT’s Sunday night telecast of the Screen Actors Guild awards. Hodel’s autobiographical book carried the elongated title of One Day She’ll Darken: The Mysterious Beginnings of Fauna Hodel. For Pine and executive producer/director Patty Jenkins, it’s a re-teaming after Wonder Woman, for which they also collaborated on a recently filmed sequel in which she again directs and he plays jaunty Steve Trevor. TNT made all six hours of I Am the Night available for review. Pine, who’s also played Capt. James T. Kirk in three latter day Star Trek feature films, is cast as battered and beaten down Jay Singletary, a haunted Korean War vet who drinks and drugs between whatever freelance assignments he can get from The Los Angeles Examiner. The fault is not with the two principal stars. Both Pine and the comparatively unknown India Eisley (The Secret Life of the American Teenager) are fully invested. Eisley plays the teenage Fauna, who’s been raised in Nevada as the “mixed race” Patty by embittered adoptive mother Jimmie Lee (a somewhat overwrought performance by Golden Brooks). “You was given to me in a goddamned bathroom” by a white woman, Jimmie Lee tells her. Fauna keeps snooping around, and it’s rather amazing how easily she gains entrance into the palatial homes of both George Hodel and his haughty, arty ex-wife, Corinna (Connie Nielsen). At the same time, Jay keeps badgering a hard-drinking newspaper editor named Peter Sullivan (Leland Orser). He’s convinced that George is either the actual Black Dahlia killer, or a copycat. Pine’s efforts to tame his demons and Fauna’s search for her birth mother are compelling at times, but I Am the Night just can’t seem to keep things humming or plausibly close the deal. Their travails and small triumphs take the two of them both to Hawaii and through the Watts riots. Still, the sought after scope and tension remain elusive. Those who get through the first several hours of this meandering mystery/morality play may well be invested to see it all the way through. It’s not terrible in the end. Nor is it spellbinding or particularly memorable. Pine gets lots to chew on while the makeup department is taxed to keep up with his various cuts and bruises. In that respect he’s served a full plate. Too bad that too much of this is either overcooked or under-prepared.